Fifteen years ago, I bought my first–and likely last–home. With two young children and associated desire to have a back yard, a swing, and a tree house, I left the core of a major city and headed to the suburbs. As advised by real estate experts, I bought the lowest-priced house on a great street in an affluent neighborhood, a short block from a lakefront dotted with old trees and multi-million dollar homes. At the time of purchase, my house was vetted by a certified inspector who pointed out that the roof needed new shingles in a couple of years, but apart from that, the house was structurally sound. I looked forward spending leisurely summer weekends playing with my kids, sitting on the back deck reading a book, and enjoying the sounds of birds, a welcome substitution to the din of downtown traffic. Upon moving in, the birds were immediately scared away by the sound of power drills, circular saws, and hammers. The house needed a few minor repairs. Nothing serious, and these were tasks I could take on myself so the costs would be minimal. The job jar would soon be empty. After a few weekends, I noticed that the list of required home repairs in the job jar wasn’t diminishing. Instead, for every repair completed, new faults were discovered that demanded attention. The job jar was like those tiny circus clown cars that magically held an infinite number of clowns. Some of these repairs seemed minor–a dripping faucet or cracked kitchen floor tile, for instance–yet would somehow take hours to complete when the trip to the hardware store to buy tools and parts was factored in. The home I thought I’d love turned into a house I hated, a black hole from which leisure time could not escape. Weekend after weekend, I’d have things to fix. The salespeople at the hardware store soon knew me by name. Twelve years later, I sold that house and regained the ability to enjoy such simple pleasures as reading the weekend newspaper while sipping a second cup of coffee. It’s pretty hard to get all three. I could have paid a lot more for a newly-built house and would not have had to worry about repairs for about a decade. Or, instead of tackling these repairs myself, I could have hired a contractor, freeing up my leisure time, but the maintenance costs would have risen significantly. I became a bit wiser from that home ownership experience and now understand that the total cost of owning something goes far beyond the initial purchase price. That house I purchased was in many ways like acquiring an open-source learning management system (LMS). You pay little for the software, but a lot on maintenance, and need to work really hard at getting it to do what you need it to do. Typically, these aren’t systems that you set up and from which you walk away, allowing them to run on autopilot. So, what you saved in licensing costs was spent paying developers to configure the system and LMS administrators to administer. 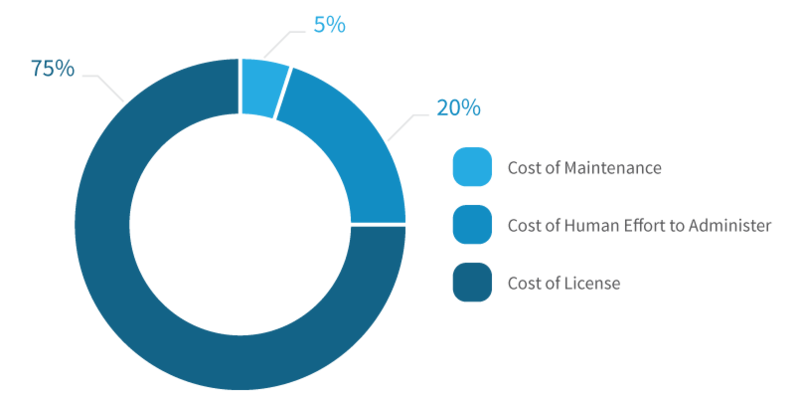 The holy grail of total cost of owning a learning management system is to find a system with reasonable licensing costs, that’s ready to use with minimal configuration, and has so much automation built in that it only requires the efforts of a part-time administrator, even with tens of thousands of learners in the system. Invariably, these are Software as a Service (SaaS)-based applications that you’re essentially renting instead of owning. It’s really common for a lot of organizations to acquire an open source learning management system as their first LMS. Just as I was lured by the low purchase price of my house, these organizations are attracted to the fact that they can download the software for free and install it on a low-cost Web server. After a while, though, they realize that their overall costs are rising. Invoices from developers assigned to configuring the system continue to roll in. Multiple LMS administrators are spending all their time trying to manage their workforce’s learning. After a few years, these organizations realize things will never get better. Their LMS maintenance and administration job jars will never be empty. That’s when they start their search for a new learning management system. Many organizations that do select an open-source learning management system as their first LMS are facing inevitability. Once they’ve outgrown that system, almost all of these organizations migrate to commercial SaaS-based systems where licensing fees are more than offset by low maintenance and low administrative costs. They then experience significant cost savings.